At Renew Crew, we pride ourselves on providing the best deck cleaning and protecting services. Our three-step process will revitalize your wood deck, leaving a beautiful space where you are happy to spend time outdoors. Wood, like all outdoor surfaces, require regular maintenance. It is exposed to the elements and will wear over time, however, there are tips that will make your deck look great longer. Water can impact any outdoor surface when left pooling on the surface. Try to remove any standing water with an outdoor broom if it puddles on the surface. The longer standing water remains on the surface, the more likely it is to seep into the wood surface or leave harsh stains. Remove any yard debris that lands on your deck. Leaves and sticks are the most common items to fall onto a deck. Sweep them off periodically so the dirt and grime that accompanies it can’t settle into the wood. This is very important in the fall months when leaves are falling for the winter. If left throughout the winter, you may have some harsh stains that will need cleaning. It’s a best practice to rinse your deck with a mild cleaning product to keep it looking great. For some clients, rinsing with the garden hose will be enough, but if you see that it isn’t really doing anything, try mixing a solution of warm water and a mild dishwashing soap. Apply the solution before and after spraying the space with the hose. A lot of homeowners invite birds into their outdoor spaces with beautiful bird feeders. While they are nice to see and hear, their droppings wear away at the deck protectants. Move birdfeeders away from your deck and further into the yard. Even when using these tips, deck cleaning and protecting will be necessary from time to time. When your wood begins to grey and dry out, please reach out to your local Renew Crew office. Our cleaning and sealing process will allow you to enjoy your outdoor living spaces once again. There is nothing like enjoying a beautiful day or night out on the lake. That is until you notice that your dock is greying and it feels rough and cracks under your steps. That doesn’t necessarily mean that the dock needs to be replaced. Docks can be cleaned and renewed and you can do it safely! Because docks are installed over water, they have to be carefully cleaned and protected. A lot of outdoor cleaning products include harsh cleaning chemicals that can harm the water below, killing fish and other aquatic animals. At Renew Crew, we don’t use harsh chemicals that will harm lakes, ponds, rivers, etc. Our dock cleaning products are environmentally friendly, allowing it to be cleaned and protected while the dock is installed and in the water. Docks should be cleaning and protected periodically to keep them looking and feeling great. Once the cleaning solution is applied to the surface, it will begin to loosen the greying, dead wood fibers. The entire space is then pressure washed to get rid of all the dirt and grime, leaving the wood looking like new. After the dock is cleaned, it then has to be protected. Obviously the deck is exposed to moisture, which means it can lead to mold and mildew. Our environmentally friendly wood sealant will protect the wood from water and bring the rich wood color back to your space. Instead of spending the summer on an ugly, weathered dock, reach out to your nearest Renew Crew office. As the leading pressure washing company, we can make sure that you enjoy the summer on a beautiful dock. I clearly remember my first play set. My parents bought a wooden play set for my three older brothers and me. It had a swing set part, a bright green slide and a little house at the top that you had to climb up to go down the slide. It kept me busy for hours, but the second year we had it, the wood started to dry out and I got numerous splinters, ouch! Play set, like fences and decks and other outdoor wooden surfaces, have to be cleaned and treated periodically to look good. And, in the case of swing and play sets, to keep them from splintering and causing cuts. Any wood surface that stays outside all year is apt to dry out and fade over time. Heavy rain can lead to moisture, mold and mildew buildup. The sun’s UV rays affect the color and texture of the wood too. When the sun hits wood, it starts to heat and dry. Wood that has some sort of protectant on it will hold the moisture, but as it dries, the wood will lose its warm color and turn grey. Not only will it look less than inviting, but it could also cause injury. Wood decks, fences and play sets will start to crack as the wood dries. Wood that is breaking down can cause some cuts and splinters if kids aren’t careful. At Renew Crew, we use our 3-step cleaning and sealing process on wooden swing sets. The first step is applying a foam cleaner to the wood. The foam is environmentally friendly and won’t damage surrounding grass, flowers or trees, but is tough enough to loosen embedded dirt and dead wood fibers. After the wood “cleaning product” does its job (normally around 10 to 15 minutes), we use a pressure washer to rinse the play set. The pressure is kept at a level strong enough to properly clean, without marking or gouging, the surface. Lastly, we protect the wood from further damage and dirt with our sealing protectant. This very important layer will repel water from soaking into the wood and acts as a shield from the sun’s harmful rays. If you have questions on cleaning and protecting your outdoor play sets and swing set, please contact your local Renew Crew office. Have you ever walked around your home and noticed some spots that just don’t look right? Are they white, gray or black? If so, that’s mold and mildew, a natural evil of the outside world. While it is natural, it can cause some health concerns if left to its own devices. If left outside, mold and mildew aren’t a major concern (except that it looks awful), but it can work its way inside your home even if it is on your siding outside. Spores get in through cracks, windows and doors. It can cause some health problems (especially for the elderly and young) including headaches, difficulty breathing and asthma. To avoid this, pay attention to what is happening on the outside of your house as well as in. Mold and mildew grow best in moist and shady areas. On your property, you may have sections that you could describe that way, but others may not be as easy to recognize. Overflowing gutters can cause a lot of moisture on your siding as it rolls down as well as around your laundry dryer exhaust. The first step in protecting you and your family is to be observant and take action as soon as you see any mold and mildew on your siding. If you catch it early and it is present in an easy to reach spot, you may be able to clean it off yourself. Make it a habit to spray down your siding a few times a year to get rid of any, dirt, mold and mildew that is loosely attached to the surface. Do not ever paint over built up mold and mildew. You are just locking it in and it can continue to grow and cause damage. Pressure washing siding should be done periodically if mold and mildew are a problem on your property. Due to the strength of a pressure washer, we suggest having a professional pressure washing company. Damaging siding with a pressure washer will just cause more issues instead of fixing the mold and mildew one. At Renew Crew, we use our three-step process to clean and protect vinyl siding. Our pre-soak foam will kill the mold and mildew and loosen it from the surface before pressure washing it all away. When the surface is clean and looking new, we will add a protectant to keep it that way! This is an important step that makes the work last that the typical pressure washing company doesn’t do. If you have any questions on cleaning and sealing vinyl siding, please contact your local Renew Crew office. This past summer, my husband and I went on a short road trip to a town not too far from us. We went to a brewery that we had always hoped to visit that was known not only for their beer, but food. There was a large outdoor patio with tables for eating. Walking up, I couldn’t help but notice how dirty the outdoor space was. It was so filthy that we ended up leaving before order anything to eat, it just wasn’t a welcoming space to eat. Landscaping. Make sure all of your landscaping is well kept and clean. Mulch shouldn’t be flowing out of beds and clients shouldn’t have to duck under any rogue tree branches. Weeds should be pulled to keep everything looking its best. Paint. Paint isn’t known to last forever. Overtime, as it is exposed to temperature fluctuations, sunlight and other outdoor elements, it will fade and chip. Make note of anything that may need attention in the next year or so. Being proactive about it will allow you to plan any big financial updates you may need to make. Lighting. If your business is ever open when it is dark outside, outdoor lighting is the easiest way to make your property more welcoming. Clients will feel more comfortable approaching your place of business if it is well lit. All walkways leading to and from entrances, as well as signs, should be lit. If the property is dark, potential clients may be hesitant to approach. Cleaning. When it comes to the outdoor areas on your property, it’s important to have surfaces professionally cleaned periodically. It is truly amazing what pressure washing can do, even to spaces with stains and dirt build-up. At Renew Crew, we work with a lot of commercial properties to make them look new again. Unlike other pressure washing companies, we clean AND seal outdoor spaces. Sealing the surface will keep it looking clean longer by stopping dirt, pollen, and other elements from embedding in the surface. If you have any questions regarding cleaning outdoor surfaces, please contact your local Renew Crew office. What should you clean your deck with? At Renew Crew we pride ourselves on being the outdoor surface cleaning experts. Our environmentally friendly products leave our clients’ space clean and they don’t harm the surrounding vegetation. We’re often asked about the other deck cleaning products on the market and what makes us better. Bleach is the most common cleaning product out there for wood. It is a strong product that does kill any mold or mildew that is built up on your exterior surface, but it bleaches the wood, giving it an unnatural color. The chemicals in bleach will continue to lighten the wood for weeks after the cleaning. When wood is cleaned with bleach a finishing product is often needed. Additionally if it gets into the dirt or onto the plants, it can harm them. There are also detergents that look similar to dishwasher detergent that is made for outdoor use. Several different detergents are used outdoors with varying levels of success. 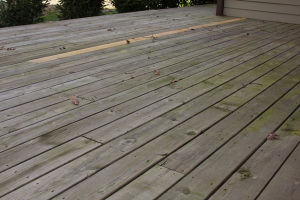 Some make the deck look cleaner, but don’t help with the mold and mildew buildup, while others can be quite strong. Sodium hydroxide and sodium hypochlorite are both known to eat away at the wood if left on too long. They can also add to the graying color. If you search on the internet, you can also find a variety of recipes for DIY deck cleaners. They are also available at your hardware or home improvement stores. Knowing that they are made for DIYers and not professionals, they tend not to work as well (if it was too strong it would make ruining the deck pretty easy). Renew Crew’s environmentally friendly deck cleaner is strong enough to remove dirt and grime, kill mold and mildew, and loosen dead wood fibers, but won’t eat away or damage your deck. Additionally, it won’t leave any lasting effects on the trees, bushes and flowers that surround your outdoor living space. The best way to ensure that you don’t harm your deck in the cleaning process is to hire a professional deck cleaning business to do the work for you. From utilizing the right products and properly using the necessary equipment, a professional will be familiar with what they are going. Please contact your local Renew Crew office if your deck is in need of some cleaning. From fences to decks, many homeowners have a wooden exterior surface. While they are great to have for entertaining and enjoying friends and family, they do require some maintenance. We are often asked the best way to keep your decks and fences clean. Here’s our guide. Wood inevitably needs to be deep cleaned. It is outside all year-round! For deep cleaning, it is best to have a professional pressure washing company clean your exterior surface. A professional has the experience to ensure that your structure isn’t damaged in the cleaning process. At Renew Crew, we have a different way of doing things that the regular power washer. The normal pressure washer uses harsh chemicals to kill the mold and mildew on wood and then uses high-pressure wash to clean. At Renew Crew, we have a three-step process that is much better! Instead of using harsh cleaning chemicals, we use environmentally friendly foam to clean the wood. The foam is applied to all the wood surfaces and works its way into the wood, killing the mold and mildew and loosening all the dead wood fibers. The foam doesn’t need too much time to work its magic. Once it is ready, we use a low-pressure wash to rinse everything away. In this step, the wood starts to look new again. The last step in the process is protection. The normal pressure washing company stops at cleaning, Renew Crew doesn’t. Our proprietary polymers keeps the wood looking better longer by blocking the dirt and grime from working into the wood’s surface. It even blocks UV-rays. Once your exterior wood surfaces are professionally cleaned, there are a few things that you can do to help your Renew Crew Clean look last. Periodically through the year, take a hose to the surfaces to wash off anything that is sitting on the wood. Pay special attention to the bottom of the fence that is closer to the ground. Dirt tends to bounce up onto the vertical surfaces. In the fall, sweep off the deck when leaves and other yard debris start to accumulate. If you have any questions on wood surface cleaning, please contact your local Renew Crew office. Thanksgiving is my favorite holiday. The food, the family, it just doesn’t get better to me. If you are looking for some ideas to for the perfect meal, you’ve come to the right place. From the Renew Crew family to yours, we hope you enjoy. If you are hosting friends and family this Thanksgiving, we understand that the day can be a little hectic, so keep the appetizer simple. These bite-sized goodies are delicious and easy! Preheat the oven to 350 degrees and place the filo cups on a cookie sheet. Cut up the brie and place small squares of cheese in each cup. Spoon just a bit of the sweet chili sauce on top (if you like spice, add more). Stick in the oven for 10-12 minutes and enjoy! Potatoes are a must on Thanksgiving, but I’m a big fan of cooking what I can before and heating it up on the special day. Holiday mashed potatoes are the best because they are absolutely mouthwatering, but they have to be prepared at least a day in advance. In a large mixing bowl, beat potatoes until lumps are gone. Add cream cheese and butter until completely mixed. Stir in the sour cream, then the milk, eggs and onions. Salt and pepper to taste. Beat until light and fluffy. Place the mixture in a greased casserole dish and refrigerate for several hours or overnight. Bake at 350 degrees for 45 minutes or until slightly brown at top. What would Thanksgiving be without dessert? Whoopie pies are one of my favorite desserts for special holidays. I make them a day or two in advance and they are perfect. Place tablespoons of mixture on baking sheet and bake for 9 minutes at 350. Frost the whoopie pies while they are still slightly warm and wrap individually in saran wrap. From everyone here at Renew Crew, have a Happy Thanksgiving! When it comes to the Renew Crew proprietary 3-step process, we are firm believers that the most important step is the last one, protection. Without a seal to protect the wood deck or fence, it will get dirty again more quickly. We are often asked about our wood stain and why we go with a semitransparent seal as opposed to a solid wood stain. When it comes to protecting your outdoor living space, ultimately the look and finish that you like is most important. Solid wood stains look and act like a paint. The color is even across the entire space, but they hide the beauty of the wood. The wood grain and knotting cannot be appreciated under a solid wood stain. If you like that consistent look, it may be a better choice for you. Solid wood stains, do have some downsides. They do tend to show wear more quickly than a semitransparent seal. The areas of the space that are most travelled will show over time. Also, depending on the product, it can be difficult to remove for future cleaning and sealing. One of biggest threats to wood is the sun and its UV rays. That’s why we don’t consider a clear sealant. Clear sealants don’t provide the UV protection that is necessary for long-lasting protection, greying your wood quickly. At Renew Crew, we realized the best sealant is a semitransparent one. The semitransparent seal allows the polymers to penetrate deep into the wood for a good seal that will last. It blocks the sun’s rays and stops moisture and dirt from working their way into the surface. Wood, to us, is beautiful. We like to see the beauty of it through its grain. As much as we can, we try not to cover that up. The semitransparent seal brings color and life back into the wood surface in a natural and beautiful way. Renew Crew does have several colors of semitransparent seal. The most commonly used colors are the natural and the cedar. While the same color may be used on several decks, it may not look the same on each one. They bring out the natural colors and tones within the wood. So one deck with cedar sealant may look more red than the next. It’s all about enhancing the natural beauty of the wood. If you have any questions, please reach out to your local Renew Crew office. Protect Your Cabin from the Elements this Off-Season. Now that Labor Day has passed, summer vacationers are closing things up and preparing their cabins, docks and boats for the winter months. As you winterize this fall, make sure to protect your outdoor surfaces now, so they look great next year. Mother Nature can be tough and if the Farmer’s Almanac is correct, this winter is looking to be a long, cold one. Moisture on outdoor surfaces like wood and concrete can lead to more serious problems like mold and rot over time if not professionally protected on a regular basis. I recently saw this cabin cleaning project from Renew Crew of Lake Gaston and Kerr Lake and thought about how important it was that the home was cleaned and protect now rather than later. This cabin, though beautiful, had clearly seen better days. The sun had dried and greyed the home’s surface over time. My guess is that the second floor was an add-on that only became obvious when the wood began to age. If the homeowners had waited longer to call Renew Crew, it would have looked even worse, but now it looks great. Keith and Kim Quinn of Renew Crew of Lake Gaston used our proprietary three-step process to clean and protect this cabin. Our environmentally friendly wood cleaner works better than most others on tall vertical surfaces like this because of its consistency. While most cleaners are liquid, ours is foam. The foam clings to the surface, allowing it to work its magic before running down the side of the house. I wish I had been there as the cabin was rinsed. The difference must have been amazing. The bottom half would have started to look similar in color to the top during this step. The last step of the Renew Crew process, and what makes us different than the typical pressure washing company, is protection. Cleaning without protection will make your outdoor surfaces look better, but leaves them vunerable to the same issues as before. Our protectant will make the wood look more vibrant and will block it from moisture, dirt and harsh UV rays. If I had a cabin that was looking a little worn like this one, I would look to have it cleaned and protected prior to the harsh winter that is being reported. Please reach out to your local Renew Crew office if you have any questions on outdoor surface cleaning. I spent this past weekend with some of my girlfriends having a girls’ weekend. With perfect weather, we spent the majority of our time chatting outside and enjoying one another’s company. We went to a nearby park for a picnic under a gazebo. While the scenery (and conversation) were great, I couldn’t help but notice the condition of the gazebo (blame the job). Over the years, the sun and heat had dried out the wood, turning it grey. The benches around the sides had a bunch of stains from things being dropped on it. The bones of the gazebo were fine it seemed, but it definitely needed a makeover. Homeowners and municipalities pay a lot of money for wooden outdoor structures and when they are first built, they look wonderful, but if they aren’t maintained properly, they can become an eyesore. Wood is naturally porous and as the sun dries it out, it not only turns grey, but it allows dirt, dust and whatever is spilt on it to work its way into the surface. Just like decks, gazebos and other structures have to be cleaned and sealed. At Renew Crew, our three step wood cleaning process works wonders on gazebos, especially compared to the typical pressure washing company. Cleaning a gazebo is more difficult than a deck because it has so much vertical space. Normal pressure washing companies use wood cleaning products that just run down vertical spaces without getting deep into the surface. Renew Crew’s environmentally friendly wood cleaners is a foam, not a pure liquid. The foam clings to the post surfaces and loosens the grey wood fibers and general grime. Once we’ve allowed the wood cleaner to penetrate the wood, we use a low pressure washer to rinse and wash away the dirt. It’s during this process that you begin to see how different your gazebo can look after it is cleaned. You can see all of the grime just wash away. If we left after cleaning your wood structures, like so many power washing companies do, you’d be calling us back sooner than you’d like. Cleaning the wood gets rid of all the dirt and grime, but it doesn’t make the wood less likely to stain again. That’s why we have a wood protectant that we use on every deck structure. Our proprietary wood sealant brings the vibrant color back into the wood. It protects against the sun’s UV rays and closes up the now open pores to all the natural elements. Depending on your weather and use, wood structures, be them gazebos, decks, fences, pergolas, etc., should be cleaned and sealed every one or two years. If you have any outdoor surfaces that need cleaning, make sure to call your local Renew Crew office. Concrete is the most preferred material for driveways owing to its strength and hardness. However, it also has a high absorption quotient that makes it a cleaner’s nightmare. Unsightly oil stains on the driveway are a huge menace, are impossible to clean, and look hideous on the driveway. No matter how hard and long you scrub or hose them, they simply refuse to give in. Various folks have some really creative but vague remedies for removing such stains from concrete. One of the most remarkable of these is kitty litter. Just put some kitty litter over the stain and leave it there for a few days before you sweep it off. That could take a good part of the stain away. However, even that wouldn’t take away all of it – and even if it did, it would probably be a fairly messy task obtaining adequate kitty litter for all of the stains. That is why you have to rely on the experts. Some jobs simply need a professional approach. The ideal way to clean obstinate stains from concrete surfaces is to use a pressure-washing apparatus. What this equipment does is, it releases jets of water with extreme pressure, directed at the stain. The sheer force of the jets pushes the dirt away from the pores of the concrete. This achieves maximum cleaning, leaving your driveway as good as new. Do remember, however, that anything with the words “High Pressure” attached to it needs professional handling. It may not be a good “Do It Yourself” idea. You can get pressure washers for hire at stores. However, unless you possess adequate training in handling pressure washers, you are strongly advised against doing so. If not handled properly, the pressure in these washers can rise up to 50 times more than the average garden hose. Such pressure can easily crack or chip the surface, making things even uglier than the stain. So stay safe, use your cautionary instincts, and call your trusted pressure washing service providers such as Renew Crew. Stains aren’t a good thing anywhere. They look ugly and lower your property’s aesthetic appeal. Get rid of them effectively and keep your driveway and other surfaces clean with expert pressure cleaning services such as Renew Crew. Vinyl siding is popular because of its durability, flexibility, and high level of performance. It is a popular alternative to wood, aluminum, and fiberglass siding. It tends to require less maintenance, but careful and strategic cleaning should be executed regularly to prevent damage or loss of beauty. One of the most popular preventative maintenance measures is pressure washing vinyl siding, but it is best left in the hands of a trained professional. There are many reasons why a homeowner should hire professional cleaners such as Renew Crew. One of the most powerful arguments in favor of hiring professionals is they know exactly what equipment and cleaning agents to use to do the job right. Their fees are well worth it. In addition, there are certain steps that should be taken before cleaning to prevent damage when pressure washing siding. Most homeowners are unaware of the preventative measures that should be taken when cleaning. Vinyl siding comes in varying levels of quality and durability. Some siding is durable enough to stand up to power washing, and some will sustain damage from pressure washing. Since most vinyl siding is installed under warranty, it is good idea to double check to see if certain cleaning agents or techniques would void the warranty. Be sure to share your warranty with the cleaners so they know how to proceed. Vinyl siding can be a prime environment for mold and mildew which is most often seen in areas that are frequently exposed to moisture – such as those that get hit with spray from sprinklers or runoff from gutters. A lot of homeowners assume bleaching will remove the stains, but forget the harsh chemical may damage the siding. Companies that specialize in pressure washing vinyl siding use professional strength (and non-toxic) chemicals with fungicides to gently remove mildew. Pressure Washing SidingMost vinyl siding looks beautiful for about 15 years if properly maintained. Homeowners damage their investment and decrease their home’s curb appeal by carelessly using bleach or other chemicals, or excessive pressure and scrubbing. Professionals, such as those from Renew Crew, know exactly how much pressure and which chemicals to use to provide effective, safe, and non-damaging cleaning when pressure washing siding. It is easy to damage your vinyl siding with a well-intentioned but poorly executed cleaning! If your siding is dingy and dirty, it is probably best to leave the task to professionals. With maintenance, care, and attention to detail, most things in and around the home will last a long time. However, when surfaces are ignored, they gather dirt and grime, losing their attractive appearance and even sustaining damage. This is especially true with concrete driveways and wooden decks. Unless you stick to a regular cleaning and maintenance schedule, a do-it-yourself cleaning could actually cause more damage to the surfaces in the process. Thorough deck cleaning manages mold. Over time, surfaces become safe havens for dangerous mold, especially wood decks and patios. As moisture builds up within, it creates a perfect environment for mold to grow. Mold then becomes airborne and can cause a range of health problems including respiratory diseases. It also contributes to the decay and breakdown of a surface. Both cement and wood surfaces take on a dingy weathered look over time – especially wooden surfaces. Professional deck cleaning should include expert pressure washing and sealing services to restore a surface to its original beauty. With wooden decks, cleaning companies such as Renew Crew seal the surfaces with polymers to protect against UV rays and moisture accumulation in the future. Regular pressure cleaning is an effective preventative maintenance measure for wooden and cement surfaces. For wood, the cleaning and sealing works to maintain the integrity of the wood. For cement, cleaning helps to remove stains and seal cracks so that unwanted vegetation and mold cannot grow. Regular maintenance prevents the need to replace wooden and cement surfaces prematurely, saving money over time. Patio and deck cleaning is an arduous task. Few people do the job right when they do it themselves. Companies such as Renew Crew provide safe, effective, and economical pressure cleaning services. If you spend a little time looking online or talking to friends and family, you will find many interesting ideas on how to clean concrete floors on your own. Some people swear by baking soda, others claim that a mix of ammonia and water will get the job done. Nothing a homeowner can do will clean concrete as well as commercial pressure washing and you will wonder why you bothered to try. Another concern is the type of chemicals. There are often plants, pets, and family members to consider when using chemicals. Lots of things can go wrong when chemicals are in use.. This is why it is beneficial to hire professional cleaners like Renew Crew. Renew Crew uses powerful nontoxic chemicals that clean effectively without harming anything. If you are thinking about cleaning your patio in advance of a party, you have better things to do then scrub cement. Even if you do not have a party to plan, you still have better things to do! Professional cleaning services prevent you from having to spend any of your precious time on such a tedious, strenuous task. Concrete patios are especially durable, which is why many people choose them. Over time, concrete will lose beauty because it is porous and can get damaged by regular use. Even well-meaning homeowners can do damage to concrete patios by misusing chemicals. It is difficult to restore concrete on your own, but cleaning professionals who specialize in commercial pressure washing techniques can restore its beauty and preserve it using a polymer sealant. Professional cleaning services allow you to focus your precious time and energy on things that matter, rather than strenuous scrubbing. Pressure washing specialists such as those at the Renew Crew are your best bet when it is time to clean your patio. Homeowners often take great pride in keeping their home’s floors clean and sparkling. They use mops, brooms, deck brushes, and various other tools to keep the inside of the home clean. Unfortunately, many overlook exterior surfaces until it is too late. A similar situation is often seen outside the home, where beautifully manicured gardens outline deprecated concrete surfaces like patios, driveways, walkways. It is easy to forget about these surfaces we walk on every day – that is until it becomes a problem or an eyesore. Unfortunately, at this point cleaning and maintaining becomes a major task. It is a good thing that homeowners have the option of hiring professional concrete cleaning specialists to restore and beautify their exterior concrete surfaces. While it can be tempting for homeowners to try to do it themselves, the results are typically lacking. While basic washing will remove built-up dirt, fungus, and mold, washing will do little to remove the grime that has worked itself into the concrete. In most instances, DIY cleaning is best reserved for maintenance, not restoration. Concrete is porous so over time grime, dirt, and other contaminants work themselves deep into concrete. Surface washing will simply not do. In fact, even after a day of intense scrubbing it may look just as dirty as it did before! The only way to get satisfying results and restored concrete surfaces is to call professionals who specialize in pressure washing. Most professionals follow a three-step process to restore and clean ugly concrete surfaces. These pressure cleaning specialists will begin by applying a special, non-toxic solution that helps isolate these deeply embedded impurities. Then they use water pressure to blast the dirt away and remove impurities from within the concrete. Once it has fully dried, they will apply eco-friendly sealants to help protect and preserve the concrete. The special concrete sealing process is what maintains the surface into the future. Companies such as Renew Crew specialize in using pressure washing techniques and eco-friendly chemicals to restore your concrete to like new condition. Regular pressure washing and occasional spot cleaning will go a long ways towards maintaining your concrete surfaces’ luster and beauty. Spring has officially sprung. How do I know you ask? Besides the flowers starting to bloom and grass beginning to grow again, the yellow/green layer of pollen on my car, sidewalk, house and deck is a surefire give away that spring is here. Gross. I hate pollen. It gets everywhere and turns everything a blah shade of yellow. When the pollen attack is at its highest, it can be very difficult to keep your outdoor surfaces clean. While there isn’t much you can do from it settling on large surfaces like decks, sidewalks and patios, you can keep your outdoor furniture pollen free if you make the effort. For example, rinsing off my deck and sidewalk with the hose will get rid of the loose standing pollen, but it’s much more difficult to rid my outdoor cushions of it. It works its way into the fabric and just when it seems clean, I stand up and my shorts are yellow. Yuck. That’s why in the early spring when pollen is at its highest, I cover my patio furniture and store my outdoor fabrics when they aren’t being used. Then, when I want to use them, I know they are clean and pollen free. Pollen does a good job of embedding itself into porous surfaces, including older woods that haven’t been treated in a while. Having a professional pressure washing company clean your outdoor surfaces will loosen embedded pollen (and dirt and general muck) and wash it away, however, the surface needs to be protected against future pollen attacks if you want to just rinse it away with a hose. Most pressure washing companies stop at cleaning your outdoor surfaces, Renew Crew goes one step further. We protect your surfaces. Renew Crew’s deck, patio, siding and other outdoor surface protectants seal off newly cleaned structures, closing up the pores within it. Those pores are where dirt and dust (and pollen) like to settle, making your outdoor areas look dirty. If your outdoor surfaces are looking less than stellar, reach out to your local Renew Crew to talk about your outdoor surface cleaning options. The mere sentence conjures up images of sunshine, fresh air and good times shared. But what if, after uttering the sentence, you step out onto your deck with a lively group only to find that winter has taken its toll – the wood is gray, dirty and in desperate need of some TLC. While it needs little maintenance throughout the year, don’t let your deck’s spring cleaning fall by the wayside. The first and most important thing you can do for your deck is a deck pressure washing, which deep-cleans your deck lickety-split and keeps it cleaner longer. Clear the deck of debris. Leaves and branches contain moisture – a known enemy of wood. The wind can only sweep away so much, so get out that broom. Wipe up stains as soon as they present. Wood is porous and will take on whatever you spill on it. Check for rusted or loosening fasteners and/or nails, especially in high foot traffic areas. Better yet,* invest in corrosion-resistant nails and fasteners*. Check deck railings for strength and safety, including splintering. Having to produce a pair of tweezers will cast a gray cloud over your gathering. Apply cleaners and sealants to your deck. A sealer not only protects your deck from the elements, it prolongs your deck’s beauty and longevity. Deck pressure washing before applying products insures the best seal. As much as you like your deck, so do dirt, mold and mildew. Power washing not only frees up clingy unwanted elements that cause rotting and decay, it also restores the look of the wood to its former days. If deck pressure washing sounds like too much of a hassle, hire a specialist, who will not damage your deck and landscaping like DIY power washing can. Also, make sure the company uses eco-friendly products. Renew Crew cares so much about safety that we developed proprietary environmentally face cleaners and protectants specifically for exterior wood. There is a season for everything. Spring is the season of renewing, recharging, and refreshing both you and your home, indoors and out. The siding of your home protects your residence from the elements throughout the year. It is stylish and practical, and requires little maintenance. But winter weather drabs, dulls and fades surfaces. Nothing cleans your home’s exterior better than power washing siding. Cleaning the large surface of the exterior of your home is a big job entailing many important details. By Power washing siding, grunge and grime is blasted away. Strong water streams eradicate the deepest dirt, keeping your siding cleaner longer, without damaging it. Applying the right amount of water pressure and angle are key, and poorly executed DIY methods often results in damaging your siding. Whether your outdoor surface is vinyl, stucco, Hardie, painted wood or brick, it’s best to hire a pressure washing specialist. Renew Crew will deep clean your siding without harming it, and apply an eco-friendly sealant that fends off the negative effects of winter weather, pollutants and UV rays while boosting the shine of your siding. Are you familiar with hose diameter? Water flow rate? Spray angles? While DIY is always an option, renting a power washer does not include a skilled technician who knows his tools well. Effectively power washing siding requires the application of exact water streams specific to each material. It also deep cleans without gouging your siding and causing damage to foliage. remove unsightly stains from your siding like chalky oxidation without damaging it. repair and seal problem areas. avoid streaking and reduce the cause of mildew buildup behind siding. set the correct temperature so that your siding will not crumple, shrivel up or warp. avoid neck strain and falls and other ladder danger that could cause you much grief. Don’t be penny wise and pound foolish. Hire a professional who knows the intricacies of power washing siding and will guarantee his work. Smell the flowers. Hang a bird feeder. Host a BBQ and let refreshed and renewed siding make that all important first impression. The professionals at Renew Crew are more than able to ready your home for spring. Call them today. A deck is more than the center for your outdoor fun. It’s also where leaves, branches and other wayward bits of nature gather. Once pristine wood becomes suddenly covered, and you find yourself often trudging outside to scrape the mess away. However, there is now a simpler—and far more effective—option for you to choose: a quality cleaning solution from a reputable pressure washing company, like Renew Crew. No deck is immune to time, with each day adding layers of grit and grime. Removing these layers requires a quality cleaning solution, but finding the right one can prove challenging if you aren’t certain what to look for. Finding someone to clean your deck is easy. Finding someone who will clean your deck correctly, however, isn’t. A business may promise strong results but fail to deliver, wasting both your time and your money. It’s important, therefore, to seek out a reputable pressure washing company, like Renew Crew. Do thorough background checks, insisting on proof of insurance and customer testimonials. Your deck is a collection of planks and memories, so choosing a company that specializes only in concrete patios, pavers or other hardscapes is a problem… and a potentially costly one. Any quality cleaning solution must be tailored to decking. Be certain that all formulas, pressure washes and polymers are suitable for your needs, rather than the needs of your entire neighborhood. A one-spray-suits-all method won’t work. Gentle Foam Formulas — Foam formulas soften the wood, easing away layers of dirt, mud and other sources of discoloration. They wash away quickly and leave planks smooth. Environmentally-Friendly Cleaning Solutions — Solutions sink deep into the grain, eliminating harmful microbes (like mold or mildew). They should be non-chlorine based to protect every deck against bleaching or fiber-stripping. Polymer Mixes — Polymers should be the final step of any system, sealing decks against the elements, like the wind, rain or ultraviolet rays. To achieve a quality solution you need a quality provider. Choose a pressure washing company, like Renew Crew, that offers specialized care and reliable results for your home. 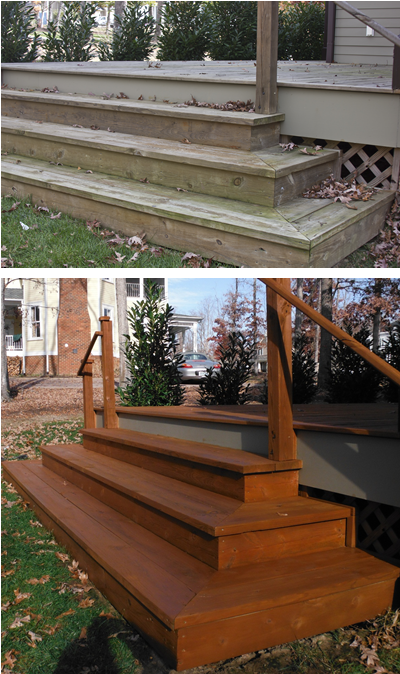 Contact Renew Crew today and transform your deck. It’s a deceptively simple task: cleaning a deck, removing the many layers of dirt and crumbled leaves. A little soap and hard work should be enough to accomplish this. A few minutes of your time will yield great rewards. What follows, however, is a series of frustrations—including an overturned bucket, a flood of suds and a struggle for dominance against a hose (which the hose won). Your deck isn’t clean. It’s just wet… and so are you. You need professional pressure washing services, like the ones provided by Renew Crew. Your deck is forever under attack, with the elements stripping away the color and texture of each plank. Professional cleaning services help to counter that. Signature techniques—such as pre-soak foam formulas, pressure rinses and polymer sealants—undo the effects of the sun, wind and rain. Meticulous systems penetrate deep within the grains, restoring every inch and protecting against future damage. This is not something you can achieve with a damp rag and an afternoon. Professional treatments are undeniably valuable. Washing services, like the ones offered by Renew Crew, do more than merely clean your deck, however. Instead they’re helpful to you. Your schedule is hectic. Trying to find the time (or the energy) to scrub down a dirty deck isn’t always possible. Professional pressure washing services spare you the need. Their techniques quickly remove grime and grit, enabling you to reap the rewards instead of wasting hours. Standard services will clean your deck. However, they’ll also harm your home, with their chlorine-based formulas causing peeling, cracking and more. Renew Crew eliminates this concern, utilizing environmentally-safe foams and treatments. These are gentle against the grain, carefully lifting dirt away and sparing you the aggravation (and cost) of a ruined deck. A true clean is one that lasts. Renew Crew provides that, offering you ways to shield your deck against future worries. Effective polymers protect the wood from ultraviolet rays, branches and more. Deck pores are tightly sealed, reducing chances of bacterial build-up. This makes outdoor maintenance far simpler. Every deck deserves professional treatments and Renew Crew offers them. Choose our pressure washing services to save time, protect your home and promote future care. Transform your deck without straining your patience. This past weekend, my husband and I joined friends for a weekend in the Virginia mountains. Our friends have a cabin that is only a few years old. Their family wanted something that had a “woods” feel, and decided that a cedar log cabin was the perfect way to go. Isn’t it nice? The rich reddish brown color is beautiful, but of course with my line of work, my mind goes to what it will look like 5 years down the road as the initial protectant wears away. The house sits on large plot of land that gets a lot of direct sunlight and eventually, the UV rays from the sun will penetrate the wood’s surface and it will start greying. While the sun is a big reason why wood turns grey, the log homes usually get dirty due to dirt, dust and mud. As the wood protectant wears away, whenever there is a big rain or wind storm, dirt and dust can make their way into the surface of the structure. Log homes, like any other type of home, require maintenance. At Renew Crew, we recommend that cabin owners invest in log home cleaning once a year or every other year. Regular wood maintenance will keep the home looking new longer and will bring back that deep wood color. So how do we do it at Renew Crew? Our three step process of course! The first step is to apply a pre-soak foam. The thick foam will penetrate deep into the wood surface loosening any built up grime as well as grey wood fibers. We love the texture of the environmentally friendly wood cleaner because it sticks to the wood and on a vertical surface it’s really important that the cleaner has time to do its job. The second step in the Renew Crew process is rinsing the structure. 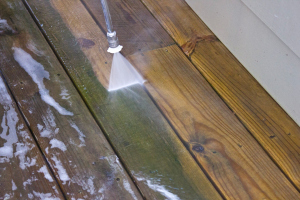 We utilize a low pressure washer that will wash away all the grime without damaging the wood. High pressure washing has been known to result in large gouges in wood surfaces when done incorrectly which no one wants. When all the wood is clean and dry, the last step in the process is the protective sealant. Who wants to clean a log cabin and not protect it, right? Not me. Our protectant covers any pores where dirt likes to embed itself. It not only will repel water and dirt, but also UV rays, as UV damages wood just like it does to skin. If you have questions on log cabin cleaning, or general outdoor surface cleaning, visit our website at RenewCrewClean.com or contact your local Renew Crew office. Know your fabric. The first thing to do when cleaning your outdoor cushions is look at the tags and find what they are made of. Most outdoor cushions will have cleaning instructions right on them. It’s always best to follow the written instructions for your cushions. Get them ready for the outdoors. Even though outdoor cushions are made to withstand some of Mother Nature’s elements, getting them ready each spring is the best way to ensure they continue to look great. You should always store your cushions in a dry place during those months they aren’t being used. When it is time to take them out for the spring, rinse them down with the hose to get rid of any dust that may have settled on its surface. Rinse them down regularly. At Renew Crew, we believe to key to outdoor surface cleaning is regular maintenance. As opposed to patio, siding or deck cleaning that only needs to be done once a year or so, your outdoor cushions need to be cleaned regularly during the season to keep the fabrics in good condition. Take the hose to them once a week to get rid of any dirt, grime or pollen. Get rid of stains as they occur. With barbecues and outdoor parties, it’s hard for anything to stay spotless for too long. 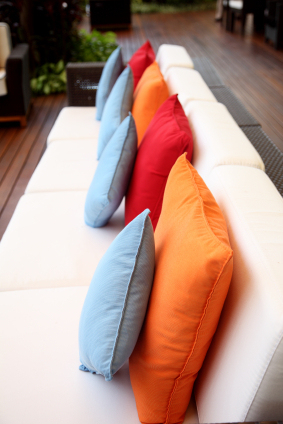 The key to getting the most out of your outdoor cushions is to clean as the messes happen. Most outdoor fabrics (make sure to check and follow the guidelines for your particular material) can be cleaned with a mild dish soap and water followed by a rinse with the hose. Just like any other fabric, the longer the stain sits, the harder it will be to remove. Know their limits. Most cushions for outdoor furniture have a water repellent on the surface which means it holds up to rain quite well, but it may need to be reapplied from time to time. If you see that water isn’t beading up on the fabric like it used to, cover the cushions when it is raining or move them indoors until you have the water repellent reapplied. Store. When summer has left and the weather turns cooler, move your outdoor cushions inside. Leaving them outside all year round will lead to fading and stains that you may not be able to get rid of. Throughout this blog we’ve discussed how Renew Crew is much more than a pressure washing company. We’re the exterior surface cleaning experts. I must admit that when I first heard how amazing the finished product is, I was skeptical. That was until I saw it in person. I spent a day with our local Renew Crew office to see the entire process from start to finish and it was incredible. To show you, here are the before, during and after photos from the deck cleaning process. The deck that was being rejuvenated was a small wood deck with some stairs to the back yard. It had seen better days. The color was uneven and grey and subtle green all over. At one point in the recent past the homeowner had to replace a decking board and the new board stuck out like a sore thumb with the more weathered boards surrounding it. To get started, our Pre Soak foam was sprayed onto all of the wood surfaces. Since our cleaning formula is environmentally friendly and doesn’t include any bleach, the technician didn’t have to worry about foam being sprayed on any of the surrounding vegetation. The consistency of the cleaning product is pretty thick allowing it to work its way into the wood, loosening the embedded dirt and grime before it dissipates. By the time the deck and stairs were completely covered with the Pre Soak foam, it was time to start washing it away. This is what I would like to refer to as the magic stage because IT IS INCREDIBLE. Renew Crew utilizes a low pressure washing setting that is just enough to rinse away grey fibers and dirt without damaging the wood. The rinsing is done along with the wood grain to make sure it looks even across the entire surface. Once the deck was completely dry, a Protective Sealant was sprayed on the deck. It gave the deck a beautiful rich color and that board that stuck out like a sore thumb? It’s not so obvious anymore. The difference is night and day. And take a look at the grass at the base of the stairs? It’s still as green as ever! If your deck, or any other outdoor surface, needs to be brought back to life, please contact your local Renew Crew. You put so much time, money, and thought into your home—why stop caring for it after you own it? Gutters and siding fade, concrete stains and cracks, and unless they are properly looked after, your property could end up looking bad and reflecting poorly on you. Luckily, we’re in the business of making sure that doesn’t happen. As one of the leading pressure washing companies in the nation, our three-step washing process is designed to not only remove stains and prevent chipping and cracking, but also protect your patio, deck, and siding from ultraviolet radiation and future stains. Bleach is a popular chemical for washing exterior surfaces, since it kills almost anything it touches. However, this means that your flowerbeds and other vegetation can be at risk. While that may be a risk some pressure washing companies are willing to take, we’re not. That’s why a Renew Crew clean involves our special, eco-friendly cleansing foam. It’s bad news for mold, stains and concrete-invading vegetation, but it’s safe for the plants you want to keep around, and pets, too. We spray our foam on the surface to be cleaned, and let it lift dirt and stains away. Then, we use our power washing prowess to gently rinse the stain-laden foam away. We use water pressure settings designed to get the job done without damaging the treated surfaces. Finally, we treat the newly clean surface with a special coating that’s UV-resistant. This polymer coating prevents fading and provides protection against future stains. No cure is permanent, but we’ll be happy to repeat the process when you’re ready for us to come again. We’re one of the pressure washing companies that doesn’t just treat concrete. If your fencing, siding, or even gutters need some work, our three-step process can restore them to their former glory as well. Gutters are notorious for gathering gunk, and most people accept it as inevitable that gutters will stain and fade. However, with Renew Crew on the job, this just isn’t so. Our proprietary foam can take out stains with ease, and the pressure wash that follows can be a well-needed “system flush” for your gutters. Finally, that same polymer coating we talked about earlier can be used to get your gutters gleaming in a way you hadn’t thought possible. Just like those gutters, house siding can stain from plant life, weathering effects, and unforeseen elements. Never fear—a ReNew Crew clean conquers all! By choosing ReNew Crew out of all the other pressure washing companies, you’re choosing the best. So make the right choice, and call today. Combined, these elements form concrete, a sturdy surface that can handle being stepped on, driven over, and beat on by the weather for several years. However, concrete doesn’t last forever; eventually, it wears out and starts to crack, unless you take proper care of it. Take it from us, it’s easier to prevent damage than replace concrete, and much less expensive, too. That’s why investing in a good" pressure washing service":http://www.renewcrewclean.com/about/pressure-washing-services-processes/ is such a great idea—the return is worth it! Left on its own and ignored, concrete can soon become discolored from unaddressed stains like motor oil or other chemicals. As houses and concrete settle, cracks can develop from normal straining. Vegetation can begin growing through those cracks, widening them and making them worse. This is where hiring a quality pressure washing service comes into play: timely and proper concrete cleaning can save yours from destruction. Concrete that uses aggregate is rough and hardy, and provides great traction so you don’t have to worry about slips and falls. However, its bumpy, rocky surface can be hard to clean. Renew Crew’s proprietary cleansing works around this problem by seeping into normally hard-to-reach spots in the concrete and lifting dirt and debris out. Pressure washing concrete is safe—both for the environment and your concrete—and extends the lifetime integrity of your surfaces. Likewise, homeowners often want unintended stains removed but want the original staining on concrete walkways or patios to remain unchanged. As a pressure washing service that’s devoted to customer satisfaction, we achieve this balance by rinsing away our eco-friendly cleaner with water pressure that is high enough to remove the dirt, but low enough that it doesn’t score the concrete or fade inherent staining. If stains and damage aren’t taken care of, they will get worse. A timely visit from our pressure washing service can save you thousands of dollars and restore your concrete’s original shine and vigor. If you want to lengthen your concrete’s lifespan and make it look great at the same time, call ReNew Crew today. Well-loved homes beam with warmth, making them inviting places for friends, family and even potential future buyers. Few things you can do to your house will make it shine as brightly as a thorough pressure washing. Siding, gutters, foundations, sidewalks, porches and decks accumulate dirt, molds and mosses as they age, giving them a worn-out appearance. Although you can rent a pressure washer from your local hardware store, many homeowners lack the knowledge to operate one properly without causing property damage. Whether your home needs a facelift or just a maintenance cleaning, pressure washing is a job best left to the professionals. Professional cleaning companies like Renew Crew own all the right equipment to ensure that the job is completed quickly and safely. Our technicians have the experience required to give your home a spotless shine without accidentally gouging soft surfaces like concrete or wood, or ripping vinyl siding from your home. Pressure washing your home is a delicate art that can result in hundreds or thousands of dollars in damage if performed incorrectly. Additionally, when homeowners underestimate the force of the water stream, injuries from power washers are not uncommon. Why waste a weekend, risk damaging your home or a trip to the emergency room when you can call the professionals at Renew Crew and get the job done in no time? Many of the pressure washing chemicals available to the homeowner are caustic or harmful to landscapes and lawns, but the proprietary formula used by Renew Crew is safe for your garden and plants. After all, a sparkling house surrounded by dead and damaged shrubs and flowers is not a welcoming sight. Damaged plants may take months to recover, if they survive the chemical cocktail bath at all, forcing you to carefully pamper or remove landscaping that may have taken years to mature. Avoid the potential pitfalls of a DIY power washing by calling Renew Crew first. The technicians at Renew Crew will do all the work while you spend your valuable weekend relaxing in your hammock, catching up on your favorite television series or reading the newest best-selling novel. Whatever you choose to do with your free time, you can trust that Renew Crew will clean your home with the same tender, loving care that you would. Contact us for a free quote today! Icy winters and hot, humid summers take their toll on decks — leaving formerly smooth, wooden beauties rough, grimey and populated with mold and mildew colonies that may lead to rot. Even the toughest of hardware store sealant can only defend your deck from this kind of beating for a short while before requiring reapplication. You certainly can rent a pressure washer from your local hardware store, but these often well-used machines can damage your deck or cause injury to the user if they are not carefully set; many deck pressure washing chemicals available to the homeowner contain chlorine or other harsh chemicals that can be dangerous to your children, pets and plants. Professional deck pressure washing takes the guesswork and anxiety out of deck cleaning, especially if your deck is made from softer woods, like cedar or pine, that dent and damage easily. Companies like Renew Crew use trained technicians with well-calibrated equipment to ensure that your deck looks like new after each cleaning. While the pros are hard at work, you can use the time to play with your kids in the yard or take your dog for a walk. Before you know it, your deck with be sparkling and you will avoid wasting a weekend fighting with a borrowed machine or hurting yourself or your property. After a thorough cleaning with landscape-friendly chemicals, your deck pressure washing professionals at Renew Crew will apply a hard polymer deck coating designed to protect the wooden surfaces from rain, ice, sun and traffic. These coatings often last much longer than those you can purchase at the hardware store, which may be little more than oil-based water repellents or stains, because they penetrate deeply into the wood. A longer lasting coating means fewer washes and less sealant, saving you money over the life of your deck and freeing up more time for family barbeques. You will be proud to host summer parties on your new deck, if only to show off its smooth, restored finish. Once thoroughly cleaned and properly sealed, simple maintenance like sweeping away leaves and cleaning up spills is all that your deck will require between occasional resealing. Professional deck pressure washing can be a surprising value. Contact Renew Crew for a free estimate and let us show you how clean your deck can be! Just like washing a car before selling it, cleaning your home’s concrete surroundings can pay off in big ways. Sure, you can say “All it needs is a good wash,” or you can showcase a looks-like-new driveway or patio, free of ugly stains or bothersome plant growth. Cleaning up the patio, driveway, or other concrete areas around your home can send the message that you take great care of your property. There’s a fine line between pressure washing concrete and permanently staining or damaging it and surrounding areas. If you think stains can affect home value, imagine what chipped concrete does. While brushing your teeth every night helps, you also have a dentist work on your teeth. Consider us the dentists on concrete—we know how to really get it clean and ensure it stays that way. When potential buyers look at a home, they are looking things as they are at the moment. A driveway covered in oil stains or a patio that’s full of cracks can take big bucks off the selling price. However, a few dollars spent now could bring in extra cash later. If you’re looking to sell your home or just want to spruce it up a bit, a Renew Crew Clean is the way to go. Our specialists will get right to work cleaning concrete around your home to erase years of wear and tear. Our approach is to use cleansing agents and water pressure that cleans concrete but doesn’t damage it. To maximize the value of your property, call ReNew Crew today. When done right, pressuring washing can be the difference between a stylish home and one in need of some work. No one wants to entertain guests when the patio is stained and worn. With a quality pressure washing service, you can have your deck area transformed into a clean and welcoming scene for your upcoming event. With the right service, it’s easy! People are often surprised by the difference a power wash can make. They don’t take a long time, but the before and after looks are worlds apart. Imagine hosting a family event or a party with friends, only to have them see a stained or cracked deck, rotting or mildewed supports, or other eyesores. Done by the right company, a quick and thorough service can take care of all those problems and earn oohs and aahs from your guests. When choosing a service, examine the size of the company. A larger company doesn’t automatically mean better service, but it does mean they have a reputation to protect. Also, it shows they have satisfied enough customers to support their growth. Those are good indicators. Beware of “weekend washers,” or people who bought a pressure washer so they could make a few extra bucks on the weekends by hosing down your deck or driveway. While they might seem like a cheap option, they don’t always have the professional know-how to deliver a quality washing job. Choosing a professional service ensures top-notch quality and means you’ll be able to find them for repeat service or if you have questions or concerns. We pride ourselves on our 3-step process that can take any worn-out deck or patio and have it looking like new in time for your guests to arrive—and don’t think we’re limited just to the backyard. We’ll happily pressure wash house siding, fencing, and more. Combining our friendly and experienced specialists with our professional equipment and special proprietary cleaner, we have what it takes to deliver all-over quality every time. For ultimate service and a custom-fit price, contact ReNew Crew today. Let us take the pressure off your shoulders—and put it into our washing service. Why is my deck grey? Homeowners spend significant money adding new outdoor living spaces to their properties and bask in its beauty when first completed. Unfortunately, many homeowners don’t understand that wood decks need regular maintenance to maintain that beauty and are surprised when they see their gorgeous new deck turn grey and dreary. At Renew Crew, we’re often asked the question, “why did my deck turn grey?” the easy answer is that it wasn’t properly protected from everything that can affect it. The sun’s UV rays are a big component to a greying deck. Like the sun burns the outer layers of your skin when left unprotected, it does the same to wood. 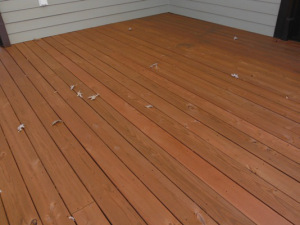 It dries out and kills the outer layers of the deck, removing its natural pigments. Decks go through a lot. Imagine how you would look if you had to stand outside through three days of rain and wind. Mother Nature beats up on decks, stripping away at the natural wood. As the wood gets weaker and develops small holes and pores on its surface, pollens, dirt and dust can get embedded, changing the color of the deck. Water affects deck negatively as well. When the wood isn’t sealed, it will absorb any water that it comes into contact with. Over time, that moisture can lead to not only greeting, but also decay and rot. Greying decks, fortunately, can be revived and brought back to their original beauty with the right cleaning and sealing. Renew Crew’s environmentally friendly foam penetrates deep into the wood’s surface, removing the grey wood and uncovering what is beneath. After the grey had been removed, it’s important to protect the wood for the sun, elements and dirt moving forward. Our protective finish will do just that. Take a look at the video below to see for yourself.